Sea turtle nests are continuing to hatch at a fast rate on the island, and more than 80 new nests have been recorded this week. As of July 13, the Boca Grande Sea Turtle Association (BGSTA) reported 495 Caretta caretta (loggerhead) turtle nests on the island. There were 511 reported false crawls (when a turtle comes up onto the beach but does not lay a nest). No Chelonia mydas (green) turtle nests have been verified so far this year. The Kemp’s Ridley sea turtle – one of the most critically endangered species of sea turtles – found near the causeway in Boca Grande on June 28 recovered well and has been released. The turtle was placed back into the water at Delnor-Wiggins Pass State Park in Collier County. It was tagged prior to release. The turtle found in Boca Grande was acting very lethargic and was transported to the CROW facility by BGSTA patrol members. 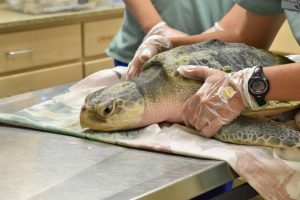 At the intake exam, the turtle was quiet but alert, with neurologic deficits (weakened ability to move flippers, delayed reflexes), and had superficial corneal ulcers in both eyes. Initial bloodwork revealed a mild anemia. Veterinarians suspected brevetoxicosis, and the turtle received IV medications upon admission. Topical antibiotics were used to treat the corneal ulcers. Bloodwork and neurologic exams were repeated daily to track its progress and adjust treatment accordingly. The red tide bloom is still affecting our sea animals. Four dead sea turtles were reported on Little Gasparilla Island this week. The BGSTA is looking for some kindhearted folks who live locally, have a boat and might be interested in transported stranded turtles to the CROW facility on Sanibel Island. Optimally, the organization would like to find a few boaters that volunteers could call in an emergency. If you are a turtle lover with a boat and you’re interested in helping, send an email to bocagrandeseaturtles@gmail.com for more information. Turtle patrol volunteers would like to remind everyone to keep pets on leashes and take trash with you after visiting the beach. Also, remember what goes up must come down, so help save turtles by not releasing helium balloons. They become a hazard if a turtle get entangled or tries to eat them. If you come across a sea turtle that is stranded or dead, or if you see someone disturbing a nest or turtle, call the Florida Fish and Wildlife Conservation Commission (FWC) at 888-404-FWCC. send an email to bocagrandeseaturtles@gmail.com to find out more details.